The SpartanNash Foundation invites 501(c)(3) nonprofit organizations that align with our mission of providing hunger relief, securing shelter and supporting our military heroes to submit a grant application. To be eligible, an organization must be located within a 30-mile radius of any of our SpartanNash corporate offices, distribution centers, food processing facilities or more than 155 retail stores, in order to support the communities we serve together. Grant applications can be submitted once annually and must be received in full by 5 p.m. ET on the day of the submission deadline to be considered for that quarter’s Foundation board meeting. Grants are reviewed by the Foundation’s Grant Review Advisory Committee – a volunteer committee of SpartanNash associates – prior to the Foundation’s board meetings. Completed grant applications are due by 5 p.m. ET on the following dates in 2019. Completed grants should be emailed to foundation@spartannash.com, and grant applicants will be notified of their status within two weeks of the board meeting. Before beginning the application process, we encourage all 501(c)(3) nonprofit organizations to read our Frequently Asked Questions section. Begin the grant application process now. Support from the SpartanNash Foundation increases the safety, well-being and self-sufficiency of youth in crisis, working to help end youth homelessness and restore families after trauma. Grant funds support the opening of Marlene’s Place for homeless pregnant or parenting youth and their children. This critically needed program will prevent homelessness across two generations, helping pregnant and parenting teens become thriving, independent young families. More than 700 youth are served through The Bridge for Youth, with 80 percent exiting to safe living situations. A grant from the SpartanNash Foundation supports program operations of the new Higher Ground Facility (formerly the Dorothy Day Center). The facility provides a safe, hospitable environment, basic needs support and transition resources for individuals who are homeless or living in poverty while promoting hope, dignity and positive change within a caring community. The Higher Ground Facility prepares and serves more than 900 meals per day and offers access to overnight shelter, veterans services, showers, laundry, health care, employment and housing services. ForKids’ mission is to break the cycle of homelessness and poverty for families and children at risk. ForKids provides housing, education and support services to families experiencing homelessness in Norfolk, Va. and the surrounding area. They also operate the Regional Housing Crisis Hotline to link families to more than 400 housing-related resources in the region. HQ disrupts the cycle of youth homelessness by meeting basic needs during a time of crisis and then creating meaningful relationships and connection points to begin the journey past trauma and into new pathways of hope and healing. Since its founding in 2014, HQ has served more than 1,100 youth. A grant from the SpartanNash Foundation ensures youth have a safe place to belong, where they can move from crisis to stability, reimagining their future and meeting their goals. Jeremiah Program provides safe, affordable housing for low-income single mother families from the Fargo-Moorhead area, so single mothers can excel in their post-secondary programs and obtain living-wage employment. Support from the SpartanNash Foundation goes toward Jeremiah Program’s new campus, which houses 20 furnished apartments designed to support single mother families while both mother and child attend school. The campus also includes a Child Development Center which can serve up to 52 children. Mel Trotter Ministries continues to partner with the community to rescue people from the streets and provide programs that seek restoration of the whole person, including financial, spiritual, mental and physical wellbeing. Support from the SpartanNash Foundation supports rescue and restoration services for adults, youth and children in West Michigan, including veterans who are experiencing homelessness in our community. Eighty-eight percent of those who have completed programs at Mel Trotter never return to the streets. Open Door Mission strives to feed, provide shelter and medically treat the homeless and impoverished in the Omaha community. Open Door Mission serves nearly 25,000 individuals a month in the Omaha community, including veterans that utilize the free services of the mission. Sojourner Shelter is a free, confidential safe haven for survivors of domestic violence and their children, with services that promote healing, increased safety and stability. They provide emergency safe haven, basic needs, legal advocacy and support programs and services. The Foundation grant supports Sojourner’s capacity to provide victim-oriented services that help them reclaim their immediate and long-term safety and stability. Since 2015, the SpartanNash Foundation has awarded grants to more than 50 nonprofit organizations throughout the communities we serve. Each year, our wholesale and MDV distribution centers also personally select local food pantries to receive $5,000 donations through the Foundation. This annual tradition goes back to 2004, and the company’s distribution centers have donated more than $1 million to community food bank and pantry partners as a result. Many of our associates also volunteer at the nonprofit organizations we support through the SpartanNash Foundation, continuing our commitment to giving back to the communities where we live, work and play. Caritas Emergency Services in St. Cloud, Minn., provides a 5-7 day supply of healthy food to households in the St. Cloud, Sauk Rapids, Sartell, St. Augusta and Wait Park Communities. They connect people able and willing to help with those facing challenges in meeting their own or their family’s basic needs. Funding from the SpartanNash Foundation supports Dégagé’s Dining Room, which serves well-balanced meals to individuals experiencing homelessness and other hardships. Meals are offered at a low cost, and patrons are given the opportunity to choose what meal they would like to purchase and how they would like it prepared. In 2017, 56,818 meals were served. On a daily basis, 400-500 homeless men and women receive support from Dégagé. Feeding South Dakota is a hunger relief organization, fighting daily to eliminate hunger in the state. Each week, Feeding South Dakota assists in providing temporary food assistance to approximately 21,000 hungry individuals and families in the state. Their backpack program gives food every weekend to more than 5,000 kids who otherwise might go hungry. Food Bank of Southeastern Virginia distributes emergency food to more than 400 partner agencies and programs throughout their 4,745 square-mile service area, including the cities of Norfolk, Portsmouth, Chesapeake, Suffolk, Franklin, and Virginia Beach, as well as the counties of Southampton, Northampton, Sussex, Isle of Wight, and Accomack. Gleaners is leading the fight against hunger in Indiana by distributing food to more than 250 partner agencies, including food pantries, soup kitchens and shelters. They also provide direct services to those struggling with hunger, through programs such as BackSacks: Weekend Food for Kids, School-Based Pantry, C.A.R.E. Mobile Pantry and Community Cupboard. GLFB services the counties of Ingham, Eaton, Clinton, Shiawassee, Gratiot, Clare and Isabella in central Michigan. They partner with a network of more than 140 member agencies to alleviate hunger one meal at a time and to create a future where everyone has access to nourishing food. GLFB distributes approximately 8 million pounds of nutritious food to nearly 100,000 people in need annually. Hidden Harvest’s mission is to alleviate hunger and reduce food waste in the Great Lakes Bay Region of Michigan (Saginaw, Bay and Midland counties). 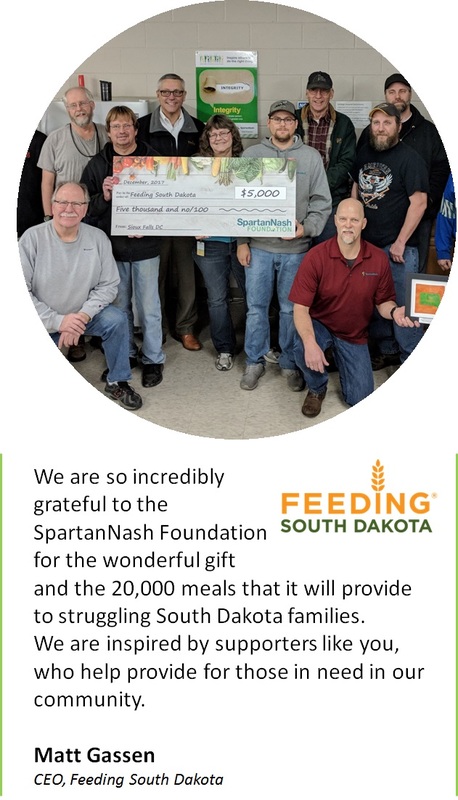 The SpartanNash Foundation grant supports the transportation of healthy foods, including the purchasing of food-handling supplies and keeping trucks on the road. Hidden Harvest supports 176 community feeding programs in the Great Lakes Bay Region and provided food to more than 82,000 families in 2017. Hoosier Hills Food Bank in Bloomington, Ind., provides more than 3 million pounds of food annually to nearly 100 other nonprofits serving people with low incomes and personal challenges, children and seniors. HHFB member agencies serve an estimated 7,500 people each week and 25,800 individuals annually. kidsPACK in Lakeland, Fla. is a nonprofit organization supported by community leaders, corporate sponsors, churches and concerned citizens joined with a core of volunteers throughout the county dedicated to improving the lives and opportunities of children. The SpartanNash Foundation grant supports Loaves and Fishes’ meal programs and initiatives, including street outreach, nutrition programs and free produce markets. In 2017, Loaves and Fishes served 695,706 free, healthy meals, reached nearly 50,000 individuals through programming and operated 28 sites open to the public. Manna Food Pantries in Pensacola, Fla., is a local, grassroots nonprofit organization dedicated to fighting hunger in Escambia and Santa Rosa counties. Its mission is to offer emergency food assistance, service the food-related needs of vulnerable populations and engage the entire community in the fight against hunger. The Maryland Food Bank is a nonprofit hunger-relief organization, leading the movement to end hunger throughout Maryland. For more than 35 years, the Maryland Food Bank has partnered with communities across the state to distribute food to individuals and families in need. Neighbors provides families and seniors with emergency and supportive services through quality food, clothing and individual support. In 2017, nearly 1 million pounds of food were distributed to at least 5,640 families, and 181 families received emergency financial grants to alleviate immediate crisis and help regain stability. Our Daily Bread is located at Lutheran Community Services’ headquarters in Bellefontaine, Ohio. It is a free meal program available to the public. The program is from 4 to 6 p.m. during the week. On Monday, Wednesday and Friday, it is held at 223 Oakland Square. On Tuesday and Thursday, it is at the Eagles Annex at Indian Lake. Our Lady of Grace Food Pantry is a ministry of Our Lady of Grace Church and works through Community Action in Minot, N.D. The Regional Food Bank of Oklahoma, a member of the Feeding America network of food banks, is the largest private domestic hunger-relief charity in the state — providing enough food to feed more than 116,000 hungry Oklahomans every week, 37 percent of whom are children. The Robeson County Church and Community Center in Lumberton, N.C., seeks to involve people across cultural, racial, class and denominational barriers in partnership with each other to address social needs and move toward solutions. The San Antonio Food Bank provides food and grocery products to more than 500 partner agencies in 16 counties throughout Southwest Texas. In fiscal year 2013, the San Antonio Food Bank provided nearly 50 million pounds of food. The mission of the San Antonio Food Bank is to fight hunger in Southwest Texas through food distribution, programs, education and advocacy. For 50 years, Valley Rescue Mission in Columbus, Ga., has worked to affect a change in the quality of life for the homeless, the needy and the addicted, helping people reenter society as productive, contributing citizens upon completion of the programs. The West Ohio Food Bank in Lima, Ohio, will deliver about six and a half million pounds of food this year to more than 100 agencies, shelters, soup kitchens and pantries in their 11-county service area. Support from the SpartanNash Foundation increases the safety, well-being and self-sufficiency of youth in crisis, working to help end youth homelessness and restore families after trauma. Grant funds support around-the-clock services including crisis intervention, safe shelter, supportive housing, counseling and case management for runaway, abandoned or homeless youth. More than 800 youth are served through The Bridge for Youth, with 85 percent exiting to safe living situations. Casa de Esperanza is a national Latina Network that operates El Refugio, a 24-hour emergency shelter for victims and their children. In 2017, they directly supported more than 1,100 in El Refugio, throughout the community and in partnership with the Domestic Abuse Service Center and Minneapolis Police Department. Family Promise of Hendricks County provides housing and supportive services for families experiencing homelessness in Central Indiana. The Foundation grant enables Family Promise to serve additional families and provide expanded services to overcome three main barriers of homelessness – lack of transportation, childcare and affordable housing. In 2017, Family Promise provided housing and support services for 39 families, of which 65 percent served were children. The Foundation grant provides support in the form of food, shelter and counseling to men while they are in recovery and preparing for productive futures. 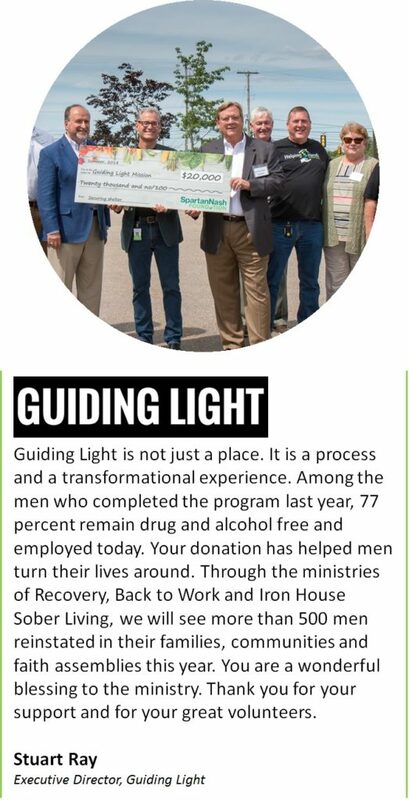 Of the 266 men served in 2017, 96 percent of the men assisted by the Guiding Light Mission left the organization with employment. Ten percent of men served at Guiding Light are veterans. House of Charity’s mission is to feed those in need, house those experiencing homelessness and empower individuals to achieve independence. Support from the SpartanNash Foundation helps struggling individuals meet their basic human needs of food and shelter and reduce barriers to their long-term self-sufficiency, so they can become engaged members of the community. In 2017, 123,828 free public meals were provided, and 291 individuals were served through the transitional housing program. Funding from the SpartanNash Foundation supports Patricia Handy Place for Women (PHPW). PHWP provides 214 beds, transitional housing and medical respite services for women experiencing homelessness in the District of Columbia, as well as 13 individual rooms to serve elder women experiencing homelessness. N Street Village provides shelter for 500 women and serves 156,000 meals annually. Perspectives’ goal is to empower homeless, recovering mothers and their children to build healthy and sustainable families through supportive housing, case management, mental health and recovery services, and child enrichment programming. In 2017, 88 percent of families moved to permanent housing at final exit. Well House provides permanent, shared, low-cost housing for people experiencing homelessness. They rehabilitate vacant houses and turn them into multi-unit homes for individuals and families. Support from the SpartanNash Foundation helps cover the costs of ongoing upkeep and minor repairs to 11 occupied homes in the Grand Rapids area. Fisher House Foundation provides comfortable housing for military and veterans’ families to stay at no cost while a loved one is receiving treatment. They are located near major military and VA medical centers and hospitals. Funding from the SpartanNash Foundation underwrites scholarships for the children of active duty, reserve/guard or retired military personnel. SpartanNash Foundation grant funds support Solid Ground’s HomeFront supportive housing program for veterans who have experienced long-term homelessness. HomeFront provides 10 units of supportive housing to two single veterans and eight veteran families at Frost-English Village, a 50-unit apartment building in Maplewood, Minn. In 2017, HomeFront provided housing to 37 adults and children in 12 families. Vetshouse is a unique nonprofit organization serving homeless veterans in Hampton Roads, Va. The SpartanNash Foundation is proud to support Vetshouse and their mission to provide housing, food, clothing, counseling and other assistance to homeless veterans of the U.S. Armed Forces in order to facilitate their return to gainful, independent, responsible and productive lifestyles. Their 12-month program provides contemporary living quarters in a group environment, assisting in job hunting, transportation, personal skills and development guidance. Give an Hour provides unlimited, confidential and free services outside the military through a network of nearly 7,000 volunteer licensed mental health professionals. Since they began providing free mental health services in 2005, their providers have donated more than 250,000 hours of care, worth more than $25 million. Through a grant from the SpartanNash Foundation, Give an Hour will increase its provider base and outreach services throughout Michigan. 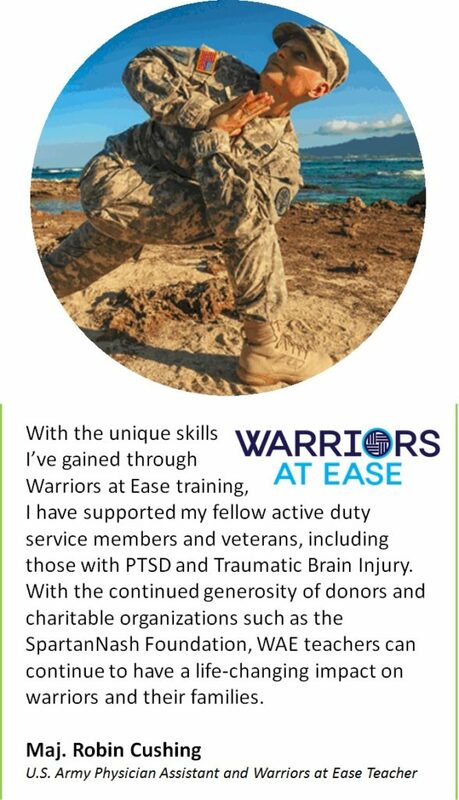 Warriors at Ease was established in 2011 to support the health and healing of our military heroes, specifically those impacted by PTSD, traumatic brain injury, spinal cord injuries, chronic pain and other conditions relating to service in the military. Their growing network of more than 1,000 teachers have been specially trained to share yoga and meditation safely and effectively with more than 16,000 servicemembers, veterans and their families annually. Funding from the SpartanNash Foundation provides physical training materials and on-site training to yoga instructors. Support from the SpartanNash Foundation goes towards the Families Moving Forward program. In collaboration with more than 70 local congregations, Families Moving Forward provides emergency shelter, supportive housing and individualized strengths-based services to families with children who are experiencing homelessness. In 2016, Families Moving Forward assisted 68 families on their journey home, including 173 children and 103 adults. Bluefield Union Mission of Bluefield, W. Va., is available to meet the social, physical, and spiritual needs of people in need 24 hours a day, every day of the year. Support from the SpartanNash Foundation is used to increase the safety, well-being and self-sufficiency of youth in crisis, working to help end youth homelessness and restore families after trauma. Grant funds support around-the-clock services including crisis intervention, safe shelter, supportive housing, counseling and case management for runaway, abandoned or homeless youth. More than 800 youth are served through The Bridge for Youth, with 85 percent exiting to safe living situations. Casa de Esperanza is a national Latina Network that operates El Refugio, a 24-hour emergency shelter for victims and their children. El Refugio is located in the Twin Cities (Minn.) and serves a seven-county area. In 2015, 23 women and 27 children stayed at El Refugio an average of 61 days. A grant from the SpartanNash Foundation supports program operations of the new Higher Ground Facility (formerly the Dorothy Day Center). The facility provides a safe, hospitable environment, basic needs support and transition resources for individuals who are homeless or living in poverty while promoting hope, dignity and positive change within a caring community. The Higher Ground Facility prepares and serves more than 900 meals per day and offers access to overnight shelter, veterans’ services, showers, laundry, health care, employment and housing services. Fisher House Foundation provides comfortable housing for military and veterans’ families to stay at no cost while a loved one is receiving treatment. They are located near major military and VA medical centers and hospitals. The grant will provide support in the forms of food, shelter and counseling to men while they are in recovery and preparing for productive futures. This grant will support three transitional housing beds for veterans in Indianapolis. Over the next year, 20 veterans will be served with intensive case management, employment and legal services. House of Charity’s mission is to feed those in need, house those experiencing homelessness and empower individuals to achieve independence. Funding from the SpartanNash Foundation will support their daily free public meal program and transitional and permanent housing programs. Their goal is to help those struggling to reach their basic needs of food and shelter and reduce barriers to self sufficiency. The grant will support the purchase of a new commercial upright freezer, allowing KAIR to continue to serve approximately 700-900 individuals each month suffering from food insecurity. Loaves and Fishes is a nonprofit meal program in Minnesota that serves hot meals to those in need. Established in 1982, they served more than a half million nutritious meals in 2016. The Neighbors model centers on having qualified volunteers and staff that provide emergency and support services through quality food, clothing, and individual support services. In 2015, Neighbors Inc. was able to provide vital help to members of the community 105,536 times. This grant will be used to support NMSH mission to provide permanent housing paired with supportive services for individuals and families experiencing homelessness either caused or exacerbated by mental illness. Our Daily Bread is located at Lutheran Community Services’ headquarters in Bellefontaine, Ohio. It is a free meal program available to the public. The program is from 4 to 6 p.m. during the week. On Monday, Wednesday and Friday, it is held at 223 Oakland Square. On Tuesday and Thursday, it is at the Eagles Annex at Indian Lake. Our Lady of Grace Food Pantry – $5,000 Our Lady of Grace Food Pantry is a ministry of Our Lady of Grace Church and works through Community Action in Minot, N.D.
Perspectives is the largest therapeutic supportive housing program in Minnesota for women and children who have experienced long-term trauma through addiction, homelessness, mental illness, and poverty. For over four decades, their programs have empowered mothers so they can begin to rebuild their lives, as well as their children. In 2015, 1,134 family members were served by Perspectives. Support will go toward the creation and implementation of Luke’s Kitchen, where the goal is to provide a warm meal to those in need every day, and to identify individuals and families at risk of homelessness and provide programs and services before they become homeless. Luke’s Kitchen will be an open table; engaging those who are struggling, supporting those who need nourishment and providing the tools and training to impact the lives of many. Sojourner Shelter is a free, confidential safe haven for survivors of domestic violence and their children, with services that promote healing, increased safety and stability. They provide emergency safe haven, basic needs, legal advocacy and support, programs and services. Our partnership will support Sojourners capacity to provide victim-oriented services that help victims reclaim their immediate and long-term safety and stability. Sojourner provided emergency shelter to 317 women and children in 2016. Solid Ground is an award winning nonprofit organization whose proven, holistic approach helps families build the strong foundations they need to emerge from homelessness into a brighter future. Through safe, affordable housing and innovative supportive programming, Solid Ground helps families transition to a higher-level of self-sufficiency and break the cycle of homelessness and poverty. Support from the SpartanNash Foundation will go towards HomeFront, a supportive housing unit for homeless veterans and their families. Vetshouse is a unique nonprofit organization serving homeless veterans in Hampton Roads, Va. It is not a shelter, but a 12-month program providing contemporary living quarters in a group environment, assistance in job hunting, transportation, personal skills and development guidance. Virginia Peninsula Food Bank distributes food effectively through collaborative efforts that minimize hunger, promote nutrition and encourage self-reliance through education. The Foundation grant will be used to purchase food for Virginia Peninsula Food Bank’s Weekend Backpack program for students at risk of food insecurity at Bethel Manor Elementary, a school for military families located on Langley Air Force Base. Warriors at Ease brings the healing power of yoga and meditation to military communities around the world, especially those affected by combat-stress, PTSD and trauma. They train and deploy certified mind-body professionals to settings where they can enhance the health and well-being of active duty service members, veterans and military families. They serve more than 16,000 warriors annually. The West Ohio Food Bank in Lima, Ohio, will deliver about six and a half million pounds of food this year to more than 100 agencies, shelters, soup kitchens and pantries in their 11 county service area. The mission of Women’s Resource Center is to protect, shelter and empower victims of domestic and sexual violence, acting as the primary agency providing direct services to victims in four rural counties. They provide emergency services, 24-hour crisis intervention and advocacy. The SpartanNash Foundation grant supports the Families Moving Forward program. In collaboration with more than 65 local congregations; Families Moving Forward provides emergency shelter, supportive housing, and individualized, strengths-based services to families with children who are experiencing homelessness. Bluefield Union Mission of Bluefield, West Virginia, is available to meet the social, physical, and spiritual needs of people in need 24 hours a day, every day of the year. The Bridge for Youth helps homeless youth in crisis in Minneapolis. Caritas Emergency Services in St. Cloud, Minnesota, provides a 5-7 day supply of healthy food to households in the St. Cloud, Sauk Rapids, Sartell, St. Augusta and Wait Park Communities. They connect people able and willing to help with those facing challenges in meeting their own or their family’s basic needs. The mission of Catholic Charities is to serve those most in need and to advocate for justice in the community. As the need for our services grows and becomes increasingly complex, Catholic Charities is working to adapt and respond. They respond in three ways – preventing poverty, meeting basic needs in times of crisis and creating pathways out of poverty. In these three areas, they focus their services in more than 35 different programs at more than 20 locations throughout the region. The Foundation grant provides support for The Open Door Women’s Center which provides overnight shelter for up to 40 women in crisis per night. A grant from the SpartanNash Foundation underwrites a mobile farm stand to feed those with food challenges in Owosso, Mich. The project is in partnership with the Shiawassee Hunger Network. The mobile truck delivers fruits and vegetables to those who do not have transportation. The Dwelling Place in Columbia Heights, Minn. provides healing and hope to victims of domestic abuse through supportive services and a safe place to call home. Women and their children may stay 12-18 months to receive healing, and acquire the necessary skills to achieve independent housing, a sustaining income, and abuse-free lives. A grant from the SpartanNash Foundation helps provide weekend meals for 120 food challenged children in the Gladwin, Mich. school district. The program is operated through the Food Banks of Eastern Michigan and Christ the King Lutheran Church. Good in the ‘Hood’s mission is to to influence, inspire and impact individuals, families and entire communities for good. 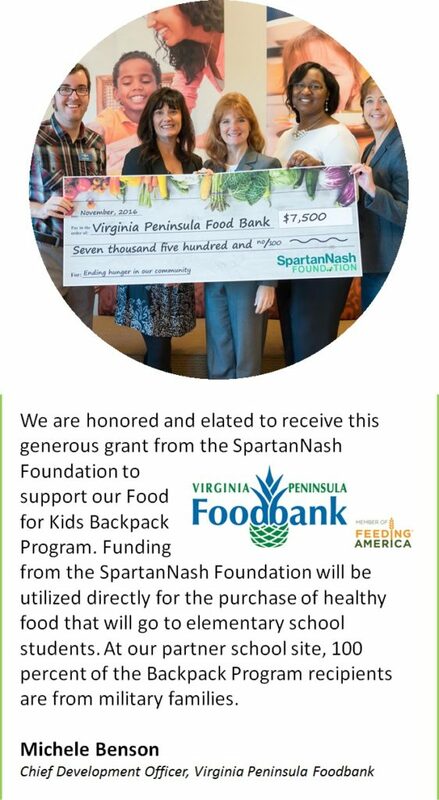 Support from the SpartanNash Foundation supports the Weekend Pack program, which provides nutritious packs of food for school age children who are facing food insecurity. The SpartanNash Foundation grant enables the Northern Michigan nonprofit community food pantry to purchase a new commercial cooler which will enable 280 families to receive fresh food not available through traditional food banks. It is the Mission of Green Gables Haven to provide a temporary, secure, nurturing environment and support to enable victims of domestic violence in Barry County to make appropriate life altering changes. The Foundation grant provides support in the forms of food, shelter and counseling to men while they are in recovery and preparing for productive futures. Hoosier Hills Food Bank in Bloomington, Ind. provides more than 3 million pounds of food annually to nearly 100 other nonprofits serving people with low incomes and personal challenges, children and seniors. HHFB member agencies serve an estimated 7,500 people each week and 25,800 individuals annually. Hope 4 Youth provides pathways to end youth homelessness. The grant from the SpartanNash Foundation supports the Drop-In Resource Center, allowing them to serve the 30-40 homeless youth who come through their doors each day. House of Charity’s mission is to feed those in need, house those experiencing homelessness, and empower individuals to achieve independence. The grant from the SpartanNash Foundation supports their veteran’s housing programs. Loaves and Fishes is a nonprofit meal program in Minnesota that serves hot meals to those in need. Established in 1982, they served more than 467,000 nutritious meals in 2015. Manna Food Pantries in Pensacola, Fla., is a local, grassroots nonprofit organization dedicated to fighting hunger in Escambia & Santa Rosa counties. Their mission is to offer emergency food assistance, service the food–related needs of vulnerable populations and engage the entire community in the fight against hunger. Neighborhood House is a a multi-service agency, providing wrap-around services for people when they need it most. Neighborhood House helps people with basic needs, education, multiple youth programs, and health and well-being, with all programs being free to participants. The Neighbors model centers on having qualified volunteers and staff that provide emergency and support services through quality food, clothing, and individual support services. Through the signature food shelf and bakery table, in 2015 15,933 individuals received food through the food shelf and 36,972 received fresh food and bakery items. The Foundation grant was matched $1:$1 by the Grand Traverse Community Foundation and used to support NMSH’s mission to provide permanent housing paired with supportive services for individuals and families experiencing homelessness either caused or exacerbated by mental illness. Our Daily Bread is located at Lutheran Community Services’ headquarters in Bellefontaine, Ohio. It is a free meal program available to the public. The program is from 4 to 6 p.m. during the week. On Monday, Wednesday and Friday it is held at 223 Oakland Square. On Tuesday and Thursday it is at the Eagles Annex at Indian Lake. Perspectives is the largest therapeutic supportive housing program in Minnesota for women and children who have experienced long-term trauma through addiction, homelessness, mental illness and poverty. For more than four decades, Perspectives has developed and implemented programs that empower mothers so they can begin to rebuild their lives, as well as their children’s. The Regional Food Bank of Oklahoma, a member of the Feeding America network of Food Banks, is the largest private domestic hunger-relief charity in the state—providing enough food to feed more than 116,000 hungry Oklahomans every week, 37 percent of whom are children. The Robeson County Church and Community Center in Lumberton, N.C., seeks to involve people across cultural, racial, class, and denominational barriers in partnership with each other to address social needs and to move toward solutions. Sojourner maintains working relationships with many police departments serving the west Hennepin community in Minnesota. Their programs serve more than 1,000 battered women and children each year through their shelter and community-based services. Solid Ground is an award winning nonprofit organization whose proven, holistic approach helps families build the strong foundations they need to emerge from homelessness into a brighter future. Through safe, affordable housing and innovative supportive programming, Solid Ground helps families transition to a higher-level of self-sufficiency and break the cycle of homelessness and poverty for The Villages at Frost-English is located in White Bear Lake, Minn. and their 10 units reserved for long-term homeless veterans and their families. Special Olympics is a global organization that serves athletes with intellectual disabilities working with hundreds of thousands of volunteers and coaches each year. They transform lives through the joy of sport, every day, everywhere. Established in 1986, the Virginia Peninsula Food Bank has been the leading hunger relief organization in the cities of Hampton, Newport News, Poquoson and Williamsburg, and the counties of Gloucester, James City, Mathews, Surry and York. The Food Bank partners with nearly 170 member agencies across its service area, and together, they have provided nearly 137 million meals. The Foundation grant purchased food for Virginia Peninsula Food Bank’s Weekend Backpack program for students at risk of food insecurity. Warriors at Ease brings the healing power of yoga and meditation to military communities around the world, especially those affected by combat-stress, PTSD and trauma. They train and deploy certified mind-body professionals to settings where they can enhance the health and well-being of service members, veterans, families and healthcare staff. The West Ohio Food Bank in Lima, Ohio, delivers about six and a half million pounds of food each year to more than 100 agencies, shelters, soup kitchens and pantries in their 11 county service area. Access of West Michigan is a faith-based leader in linking congregational, individual and community resources to eliminate hunger and reduce the impact of poverty in Kent County, Michigan. Beacon is an interfaith collaborative of congregations ending homelessness through housing, shelter and advocacy. They are located in St. Paul, Minnesota. Boys Town is located near Omaha, Nebraska, and is home to more than 600 children and teens, many of whom have fled abuse or neglect in their own homes or have struggled with behavioral problems. The Foundation grant helps underwrite the Boys Town youth garden, which supports the nonprofit organization’s mission of changing young people in body, mind and spirit. Catholic Charities works to prevent poverty, meet basic needs in times of crisis and create pathways out of poverty. They focus their services in over 35 different programs at more than 20 locations throughout the region. Food Bank for the Heartland is a 501(c)(3) nonprofit organization in Omaha, Nebraska, that distributes food to 244 schools and 225 food pantries, emergency shelters and other nonprofit partners. They are the largest food bank in Nebraska and Iowa, serving 93 counties in the two-state region. Feeding South Dakota is a hunger relief organization, fighting daily to eliminate hunger in the state. Each week, Feeding South Dakota assists in providing temporary food assistance to approximately 21,000 hungry individuals and families in the state. Their BackPack Program gives food every weekend to over 5,000 kids who otherwise might go hungry. Food Bank of Southeastern Virginia distributes emergency food to over 400 partner agencies and programs throughout their 4,745 square-mile service area, including the cities of Norfolk, Portsmouth, Chesapeake, Suffolk, Franklin, and Virginia Beach, as well as the counties of Southampton, Northampton, Sussex, Isle of Wight, and Accomack. The Great Plains Food Bank’s mission is to end hunger in North Dakota and western Minnesota through community partnerships. They are the largest hunger-relief organization in North Dakota and serve as its only food bank. Each year, they touch the lives of one in 9 individuals who seek emergency food assistance. Hoosier Hills Food Bank in Bloomington, Indiana, provides over three million pounds of food annually to nearly 100 other nonprofits serving people with low incomes and personal challenges, children and seniors. HHFB member agencies serve an estimated 7,500 people each week and 25,800 individuals annually. Loaves and Fishes is a nonprofit meal program in Minnesota that serves hot meals to those in need. Established in 1982, they served over 467,000 nutritious meals in 2015. Manna Food Pantries in Pensacola, Florida, is a local, grassroots nonprofit organization dedicated to fighting hunger in Escambia & Santa Rosa counties. Their mission is to offer emergency food assistance, service the food–related needs of vulnerable populations and engage the entire community in the fight against hunger. Originally called Hope for the City, Matter is a nonprofit on a mission to expand access to health, next door and around the world. Located in St. Louis Park, they have helped distribute more than $550 million in wholesale goods to people in need all over the world. Neighborhood House is a multi-service agency in Minneapolis, Minnesota, that helps people with basic needs, education, multiple youth programs, and health and well-being. Neighbors is located in St. Paul, Minnesota, and is a non-profit, social-service agency providing emergency assistance and supportive assistance programs to low-income community members in northern Dakota County communities. Our Lady of Grace Food Pantry is a ministry of Our Lady of Grace Church and works through Community Action in Minot, North Dakota. Perspectives is an award winning, multi-program, human service agency located in St. Louis Park, Minnesota. They provide support for women and their children suffering from addictions, mental illness and poverty. The Robeson County Church and Community Center in Lumberton, North Carolina, seeks to involve people across cultural, racial, class, and denominational barriers in partnership with each other to address social needs and to move toward solutions. The Food Bank, Inc. was founded in 1998 and serves the Statesboro, GA, area. The Michigan City Salvation Army in Michigan City, Indiana, offers emergency assistance and basic human services to some of the most vulnerable residents of their community. For 50 years Valley Rescue Mission in Columbus, Georgia, has worked to affect a change in the quality of life for the homeless, the needy and the addicted, helping people reenter society as productive, contributing citizens upon completion of the programs. Vetshouse is a unique nonprofit organization serving homeless veterans in Hampton Roads., Virginia. It is not a shelter, but a twelve-month program providing contemporary living quarters in a group environment, assistance in job hunting, transportation, personal skills and development guidance. The West Ohio Food Bank in Lima, Ohio, will deliver about six and a half million pounds of food this year to over 100 agencies, shelters, soup kitchens and pantries in their 11 county service area.